This is the first complete edition of the private biblical notebook that Jonathan Edwards compiled over a period of nearly thirty-five years. Edwards’ "Notes on Scripture" confirms the centrality of the Bible in his thought and provides more balance to earlier depictions of his writings that emphasized the scientific and philosophical while overlooking the biblical dimension. 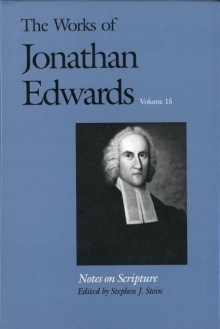 In this critical edition the entries appear in the order in which Edwards wrote them, beginning with a short commentary on Genesis 2:10-14 that he penned in 1724, and ending with his last entry, Number 507 on the Book of Solomon's Song, written two years before his death. Stephen J. Stein is Chancellors’ Professor of Religious Studies and chair of the Department of Religious Studies at Indiana University. He is the author of The Shaker Experience in America and editor of Edwards’ Apocalyptic Writings, both published by Yale University Press.